When You Need A Concrete Pump In San Luis Obispo, CA I’m The Guy To Call. Got a concrete job? 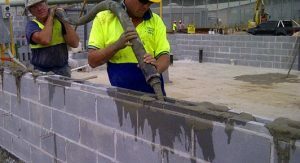 Got a concrete slab or footings that need pouring? Maybe a block wall that needs some grouting? For all those jobs I’m the guy you can call for all those concrete pumping services. Hi, I’m Rigoberto resident of the beautiful San Luis Obispo, or as we call it, the Central Coast, and the guy you need to call when you’re looking for a concrete pump for hire. Over the past 10 years, I’ve been involved in the concrete business. I’ve worked and took a great deal of pride in all types of concrete jobs from setting up forms, pouring, and finishing out here in San Luis Obispo, CA and now I focus that same hard working ethic, attention to detail, and git-r-done attitude for concrete contractors here on the central coast when they need concrete pumping. When you need a concrete pump to pour a 5-yard slab for a patio or a 100-yard footing, or you need a concrete pump to grout a 3 foot or a 10-foot high block wall or a 10 foot… when you hire me? You can be sure my I will show up to the job on time and get it done. You want to know something else? I also have no problem being called at the last minute when that “other concrete pumper” flakes out and not show up. You’ve got a concrete job . You’ve got to get it done fast and get it done on time. Maybe you need some a driveway pumped. Maybe you need to get concrete around a to the back of a home. Maybe you just don’t feel like dealing with tailgating the concrete on that next job. If so… and if you want the best concrete pumping company in San Luis Obispo, California and nearby area… who is fun, easy to work with, and treat the work done on your property like if it was their own? Grab your phone off of your side belt clip and give me a call. “I’ll be there.”… Simple as that. And if for some reason you can’t get to a phone, simply fill out the form with your name, number and email address (hey, just cuz I run a concrete pump doesn’t mean I’m not up with technology! Besides, I learned this stuff from some friends running a business called Junk Masterz.) to the right of this page and I’ll get back with you right away. I’m really excited to show you why I feel like the #1 concrete pumping service in San Luis Obispo, county. Residential areas, new construction sites, commercial properties, brand new commercial properties, rural areas for well seals and all types of different jobs. My pump can pump grout into block wall with my smaller 2-inch line whether the wall is a foot high or 15 feet high. I carry enough hoses to reach areas that are 300+ feet away. My pump can handle a 200-yard pour or a tiny 2-yard pour. I can pour large flat work areas or large footings. I do work in residential areas and do work for homeowners. Can pump all types of concrete blends from slurry to pea gravel grout, and 50/50 blends with my 2 and a half inch hose. I work on Saturdays too if needed. What cities do I serve? I serve anything in San Luis Obispo CA, including Paso Robles, Atascadero, Templeton, San Miguel, Santa Margarita, Morro Bay, Cayucos, and Cambria. How much are you going to charge me for set up? Well, this totally depends on the job you need me to pump. There is a whole lot of variables to it like the number of yards I need to pump, the footage of hosing that I need to lay out, the amount of time a particular job does end up taking. I do charge a flat rate to start and it’s completely competitive with other concrete pumps in the area. Go ahead and contact me and I’ll give you a quick free estimate on how much your particular concrete pumping is going to cost you. Oh, and there’s no strings attached. No pressure. No raising the price later on. We concrete folks here on the central coast keep our promises. Call (805) 706-8890 to set up the day and time of your job. Look, I might not be the cheapest price when it comes to the average rate for concrete pumps here in this county. That’s because when you hire me, I show up on time, I’m ready to go before the mixers arrive and I will give you my absolute best work in the most efficient way possible. If email works better, please use the form halfway up this page. Until we meet this is Rigoberto, the former carpet cleaning San Luis Obispo owner and now passionate concrete pumping service provider in the Central Coast. P.S. – Contact me anytime, day or night. (Hello? We live the internet age!) Whatever job you need getting done, whether it’s a quick 100 foot away 5-yard pour or a 300 foot away 200-yard footing job, find out why local San Luis Obispo, California concrete contractors call me when they need a concrete pump. That’s because, with me? There’s no worry that I won’t show up to the job and no stress of my equipment not being able to get the job done.